Aloha Guests, please note the rate of this lovely home is dependent on the number of people staying. Ulu Niu is a rare find: a beachfront three bedroom vacation property at an affordable rate. Lovingly hand constructed by the owner 20 years ago, this hideaway is set in a lush coconut grove that provides privacy and shade from the tropical sun. Yet just beyond the verdant plantings lies a white-sand beach on Waialea Bay: “perfect sand, gorgeous water, interesting shapes to photograph, a treasure trove of interesting shells and coral,” wrote one guest. 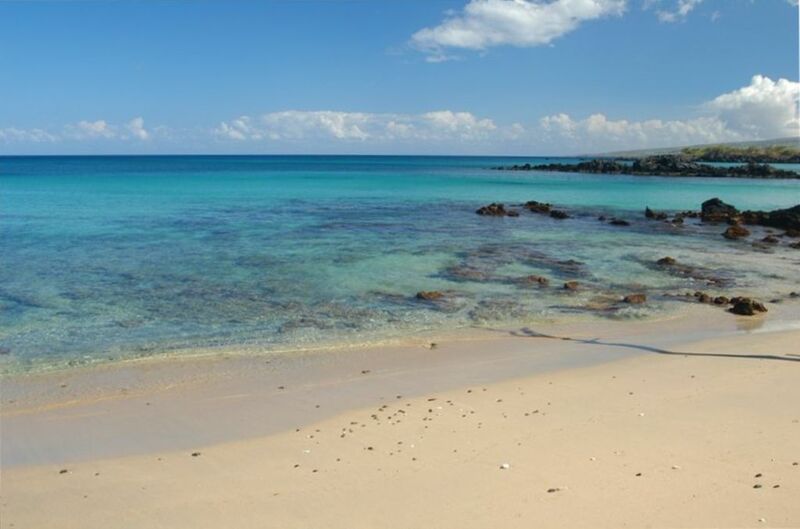 This is one of the few natural sand beaches on the Big Island. Swim, dive, snorkel and sunbathe on the beach right in front of the house—the perfect spot for children and adults alike. Mature plantings, carefully situated, plus two-level design create a haven of comfort for enjoying beach living while capturing the best of the coastal breezes. Beautifully crafted with oak floors, redwood paneling and koa shelving, Ulu Niu is lovingly decorated with artwork by renowned local artists, all related to the owners. Casement windows with venetian blinds between the glass layers attest to the thoughtful design of this tropical home, carefully maintained by the original owner/builders. The second floor contains the main living area with high beam ceiling, spacious open dining room and kitchen plus comfortable seating for reading or watching television. Just outside is the covered lanai, which offers open-air dining with cooling breezes, ocean views and Hawaii’s famed sunsets. The two bedrooms on this level include an oceanview bedroom and a full bath. A large dorm-style bedroom on the ground floor, with a separate entrance, contains multiple beds for teens or younger children with a nanny. Also provided are a bathroom and shower plus a laundry room. The carport keeps your vehicles out of the sun for comfortable driving. This home is managed on behalf of the owners, by Mary Fox, R(B) 2 Papayas, LLC. Mary holds an active real estate broker's license in the State of Hawaii. Loved it. Relaxing and comfortable home. We stayed in the Ulu Niu property and thoroughly enjoyed our visit. We toured around the island quite a lot and saw a great many wonderful things, but the beach we had access to was among the nicest we saw anywhere. The folks at 2 Papayas were great and we felt quite at home. My family ( 2 daughters, son in law and two year old grandson) was on the big Island for a wedding. My daughter and her husband and toddler stayed in the lower apartment. The house was very clean and well stocked. We loved the house!! It was steps to the beach. The house had everything you would need to go to the beach, chairs etc. The property manager was very helpful. She had a few groceries delivered so we would be able to have breakfast in the morning. We will be definitely be coming back in the future! In love with this house and location! This house is very charming and the location is AMAZING! Steps to the beach! We stayed here as a family of 4 (2 adults, 11 year old and 14 year old) for 9 days. The house was very clean and had everything we needed including beach chairs, coolers, etc. The kitchen was fully equipped. We were here mid July - no AC - but, the breeze off the ocean was almost always enough air for us. The bathrooms could use updating but certainly weren't spending our time in the bathroom! When the guys would go diving, it was very safe and very easy for my daughter and I to just hang out on the beach and in the house. When our teenage son decided he would be lazy, he just stayed in the house and we were steps away loving the beach and water. We enjoyed the open concept kitchen and living area as a family and loved the lanai for meals and just relaxing. The location in Puako is amazing and the sandy beach was pretty quiet (on our end in front of the house) even though it is a public beach. Snorkeling and swimming, stand up paddle boarding were great right off the beach. The outdoor shower was a great feature, too. Parking, a clothes line for scuba stuff and towels, the list goes on with the details to make our life easy. I am a total snob about accommodations and I was in love with the charm of this house. It's not "fancy", but, it is awesome! I would stay here again in a heart beat! Also, the booking agent was beyond wonderful and friendly and helpful. If you get a chance to stay here, go for it! Rate varies from $575-$875 @ night based on the number of guests. The standard rate is for 4 persons. Please call or email manager directly for an exact quote for your group. We are a local, professional, real estate company licensed in the State of Hawaii, managing the home on behalf of the owners.